This London establishment has been sitting unobtrusively on Curzon Street for 77 years. It has stayed there as the world around it spins madly on, living through huge changes to London’s West End, a World War, seventeen Prime Ministers and the employment of one Nancy Mitford. And thank goodness for that. 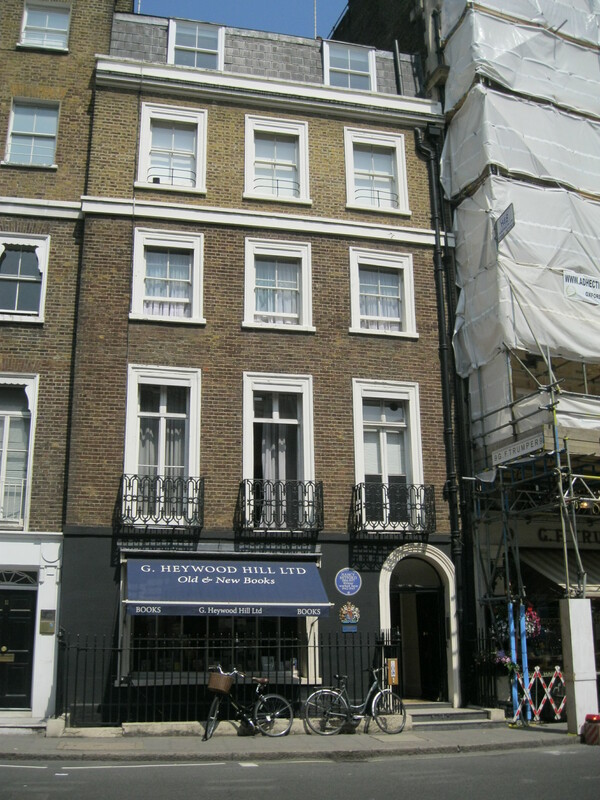 Just minutes away from Green Park, Heywood Hill is tucked away from the madness of Mayfair, on the more civilized side of Piccadilly. To find it you must wander through roads with names like Half Moon Street and Shepherd Market, where little patisseries, bookbinders and restaurants replace Starbucks and McDonalds and London’s rich and famous drink champagne al fresco at 11 am on Wednesday. I couldn’t help but wonder how much the area has changed since Heywood and Anne Hill opened shop in 1936. Fortunately, it seems that despite what goes on in the rest of the world, Heywood Hill, like Narnia, is a place where time works differently. The years of history spill out from every shelf and are visible in every browser’s wide-eyed awe. It’s the kind of shop whose regulars aren’t only the local families, but book-collectors who have had accounts set up for decades. Today, I had the slightly surreal experience of meeting a book-collecting millionaire from Dubai. 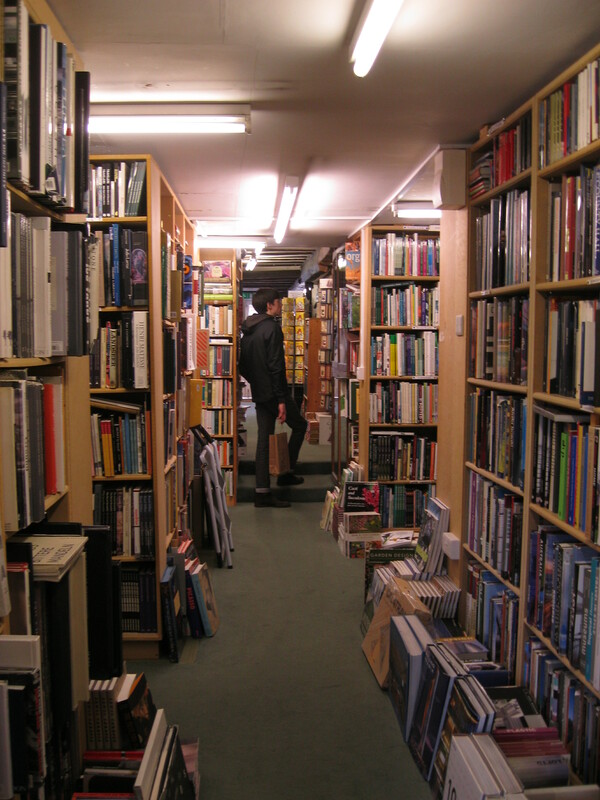 And by ‘meeting’, I naturally mean ‘eavesdropping on the conversations of.’ The man wandered around the shop like he’d been coming for years, picking up books to throw onto the pile the already-frazzled bookseller was trying to keep organised. I had to pity her; it seemed that every time she thought she had his order sorted, he’d pick up three more books to add to the pile. While he is probably a nightmare of a customer, I couldn’t judge him too much because the earnestness with which he was enjoying himself was really quite adorable. He was the proverbial kid in a candy store. Wouldn’t it be nice if we could all afford to say, ‘Oh I have a copy of this already, I think, but this edition has such a nice cover that I think I’ll have it too.’ For now, we have to fantasise. Fortunately Heywood Hill is the perfect place for flights of fancy. 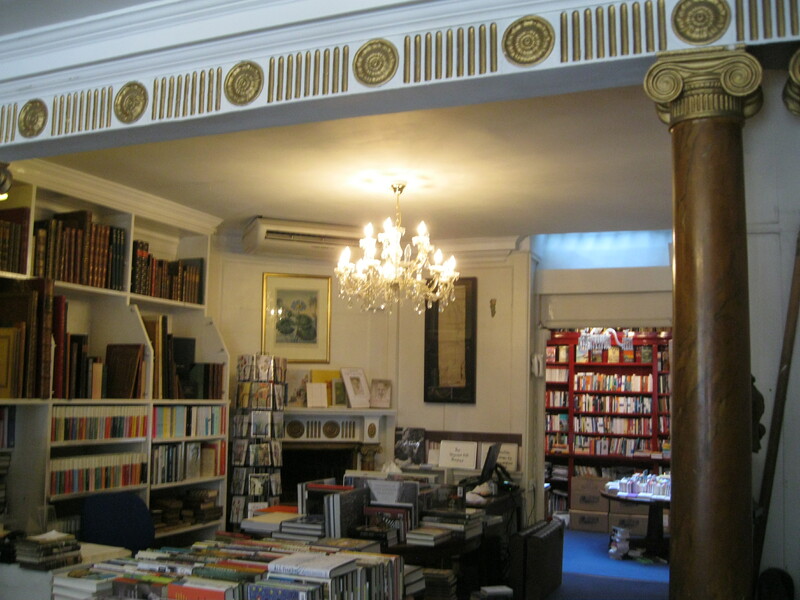 The decor of the bookshop reflects its history; located at the bottom of a long and narrow row house, the timeless London style is continued inside, where beautiful gold details decorate the walls and a chandelier hangs from the ceiling. 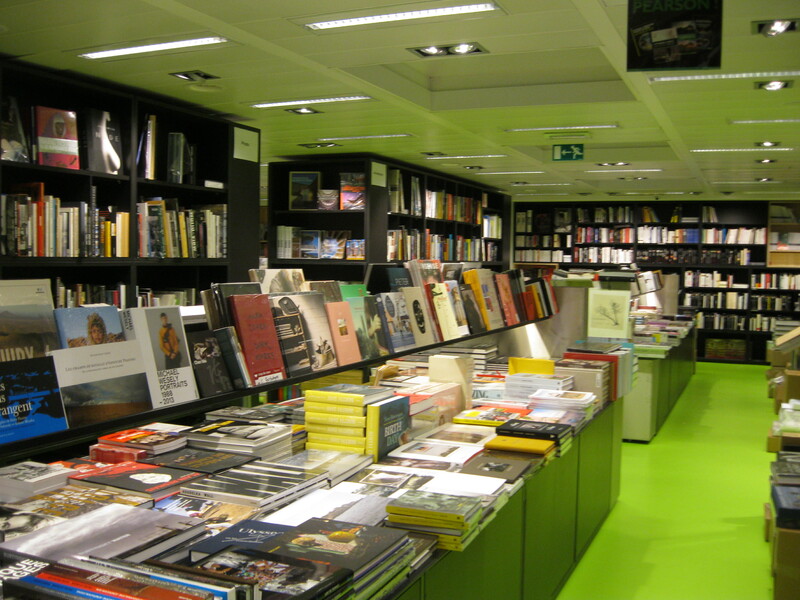 The books are arranged in a way that really encourages browsing; there is a small alcove in the corner where part of the fiction collection is housed, just big enough for one person at a time to duck in and be surrounded on three sides by walls of books. In the centre of the room are a series of tables, arranged by genre, where piles of books are just waiting for you to dig through them. 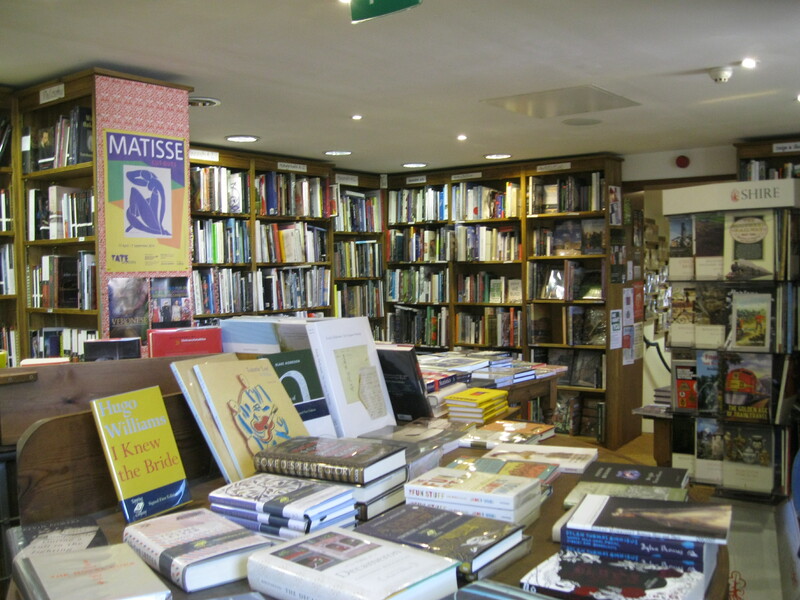 Heywood Hill has a fantastic selection; it’s one of those bookshops where every single book deserves a look, where you find books you’ve never heard of but which immediately intrigue you, where each new discovery is more exciting than the last. 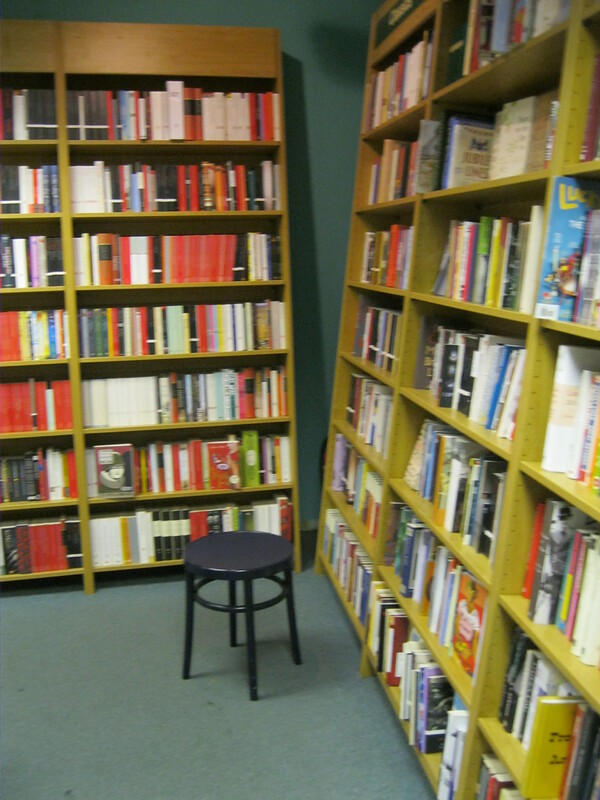 As I moved around the tables and shelves, the stack of ‘possibles’ I was cradling in my arms like a baby grew taller and, like the original Matilda of Roald Dahl’s novel, I felt like I needed a wheelbarrow. I ended up leaving with only two books, both of which were new and therefore at retail price. The first was Fictions, a collection of short stories by Jorge Luis Borges and the second was a Penguin Classics collection of Russian Magic Tales from Pushkin to Platonov. I’ve never read anything like either of them before, so I can’t wait to tuck in. 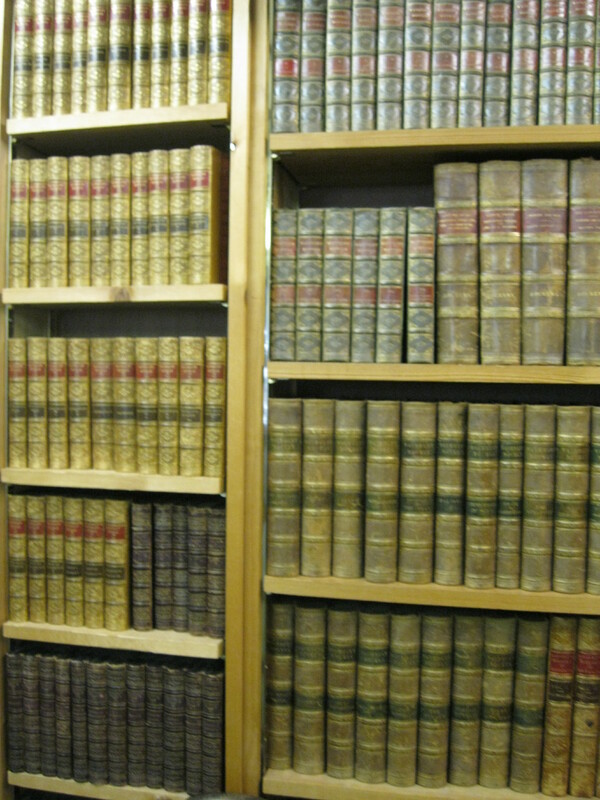 The shop’s combination of used, new and antiquarian books provides a truly unique range of options. 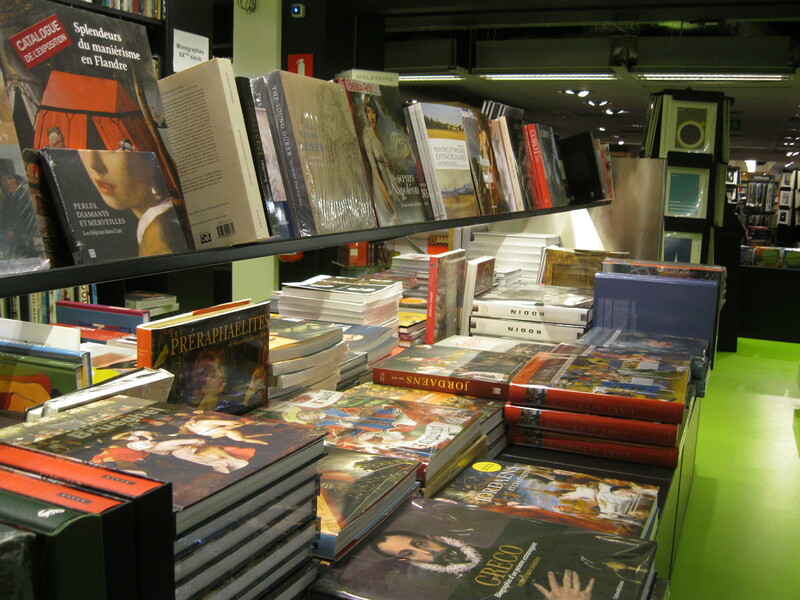 The selection of Fiction, Poetry, History, Art and Architecture books is brilliantly curated, with interesting and intelligent choices that reflect the diversity of what’s on offer in contemporary publishing, as well as a really sound knowledge of the classics and more obscure almost-classics that deserve to be returned to the limelight. I was impressed with the scope of the collection, which went far beyond the canon of white Western males. 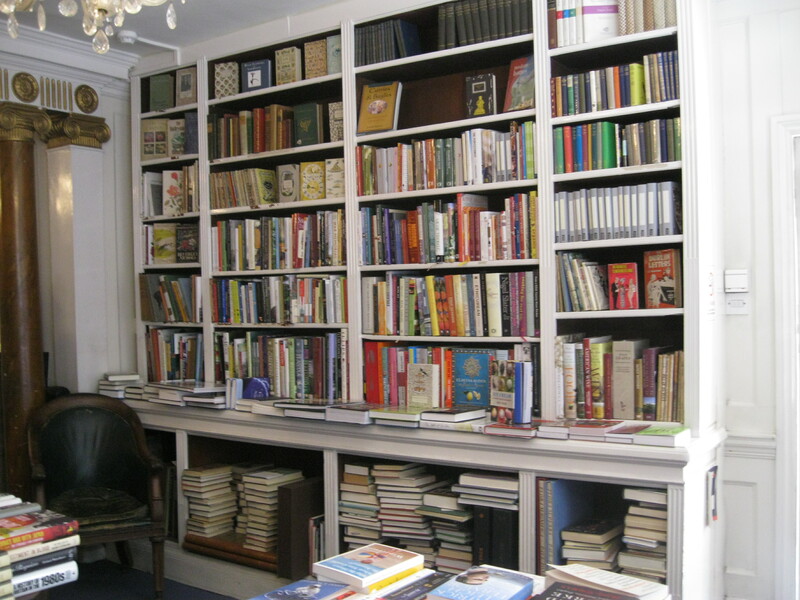 I rave a lot about Persephone Books on this blog, but expanding the canon is kind of what they do, so I think I’m justified in noting that Heywood Hill stocks a small selection of their titles. But they also go even further, displaying the best literature from all over the world. It’s a great place to go to find an unexpected title from South America, Africa or Asia. Part of the fun of exploring literature from outside your own culture is that you have no idea what you’re going to get or even what you’re looking for. And an added bonus is that you haven’t already been programmed with popular opinions, prejudices and preconceptions as we all are within our own traditions, so you have total freedom to judge the books on their merit. Heywood Hill facilitates this kind of free exploration by stocking a great selection – perfect for exploring and discovering – that you can trust to be high quality. Like the city that gave life to it, Heywood Hill is truly cosmopolitan; a place where misfits from all four corners of the earth can feel at home. In the basement are the children’s books. A whole room full of them, where cardboard versions of Madeline and The Twits peek out at young browsers, but no other distractions take their attention away from the books. 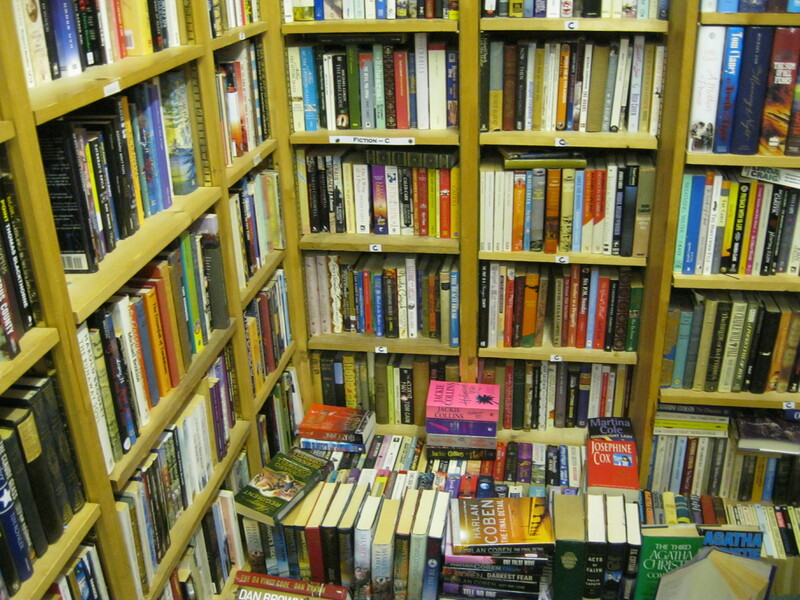 Like upstairs, here there is a mix of pricy rare first editions, used editions and new books for retail price. 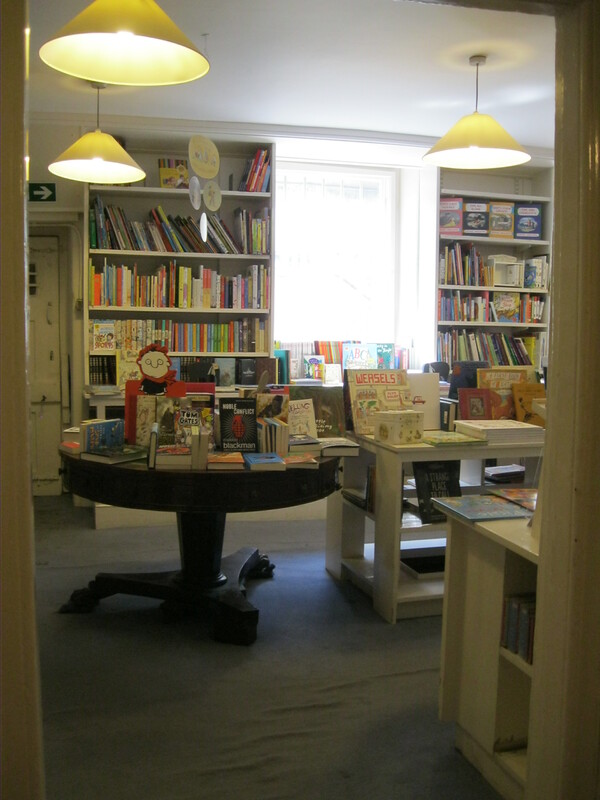 It’s a bright and happy room, warm and accessible for children and for those of us who just love children’s books. There is something for everyone here and you can see how a child could grow up in this room, like I did, moving from storybooks to chapter books and all the way up to the confusing and wonderful minefield that is Young Adult literature. There’s even a small collection of books for children in other languages. 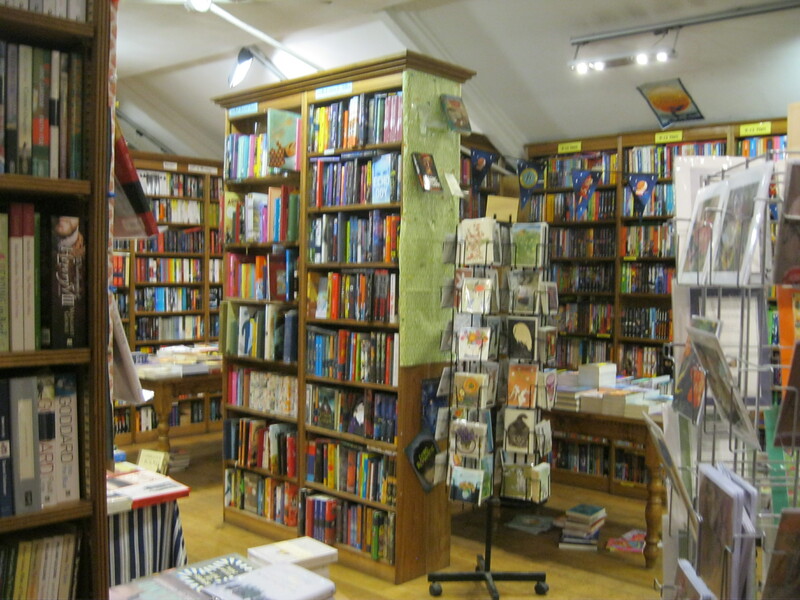 All I can say about this neat, prolific and truly lovely children’s section is that if more bookshops had somewhere like it – where a child can sit and read without being distracted by a million toys and trinkets – the world would be a better place. 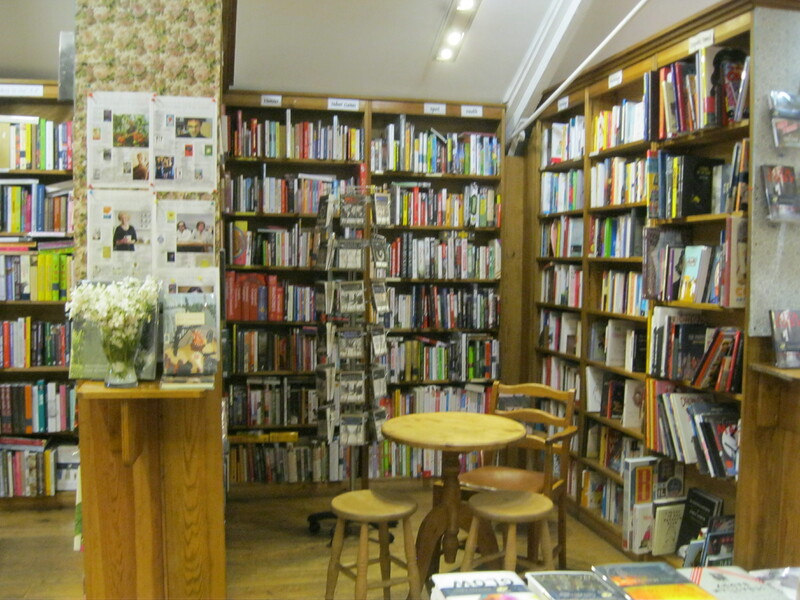 When I visited this lovely bookshop a few weeks ago, the Hay Festival was kicking off. 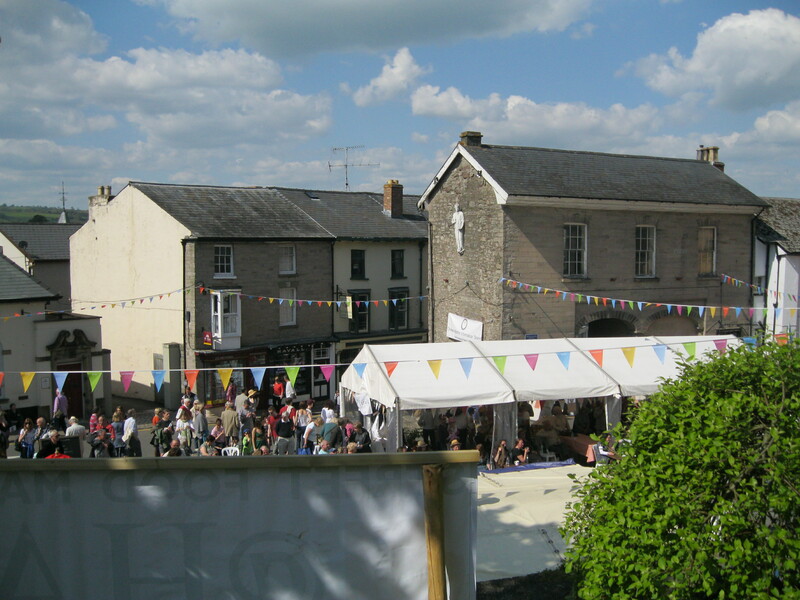 On the first weekend of the festival, the sun had come out and the streets of this little Welsh town were full of laughter and music. 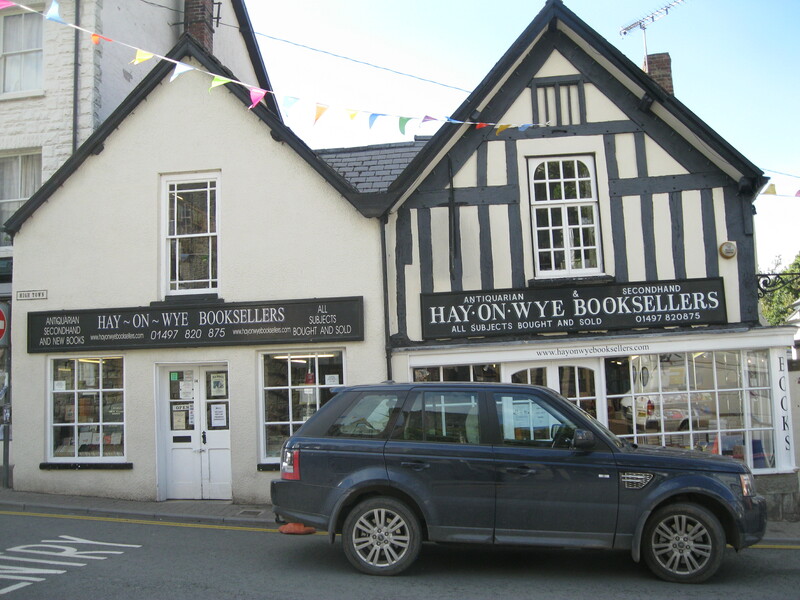 Hay-on-Wye Booksellers is perfectly situated on the High Street, right at the centre of the action, making it an indispensable part of the Hay-on-Wye experience. Street musicians and market stalls filled the square outside this shop and tourists, grateful for a bit of good weather, bared their legs and arms lying on the grass in the shadow of the town’s medieval castle. 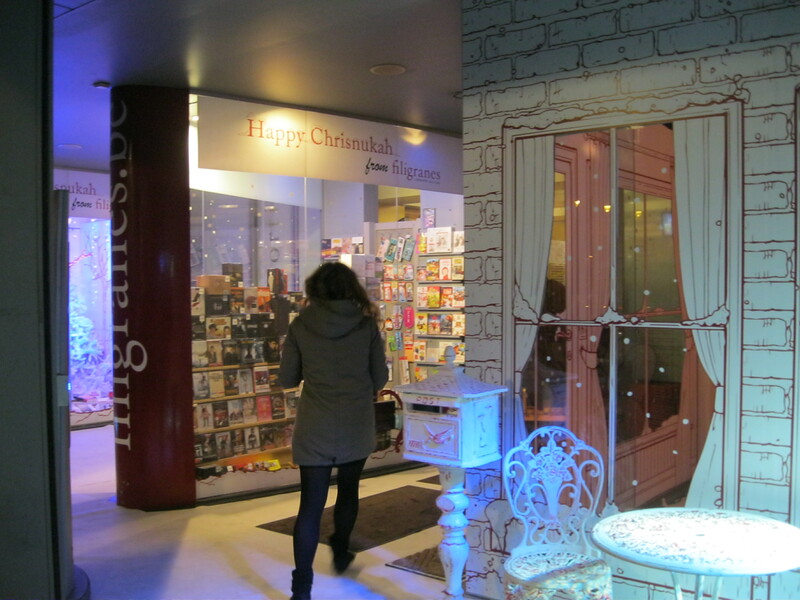 The atmosphere was decidedly festive, celebratory even, and even those trying to read didn’t seem too annoyed to be distracted by the sounds of this traditional, Starbucks-free High Street. Inside, the sunlight filtered in through the shop’s wide front windows, bringing the jovial atmosphere but only a tiny bit of the noise with it. It was perfect. 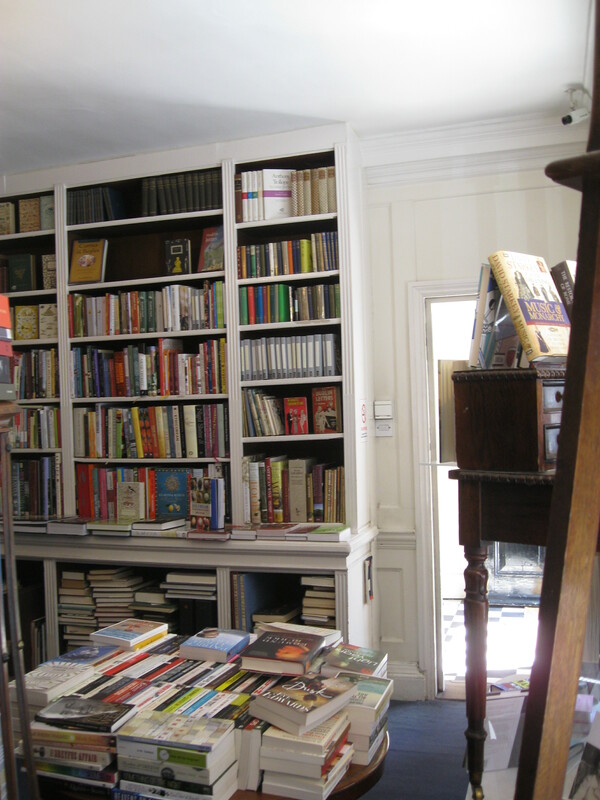 The two front rooms on the ground floor are filled with classic and contemporary fiction in hardcovers, cheap paperbacks and old antiquarian tomes. 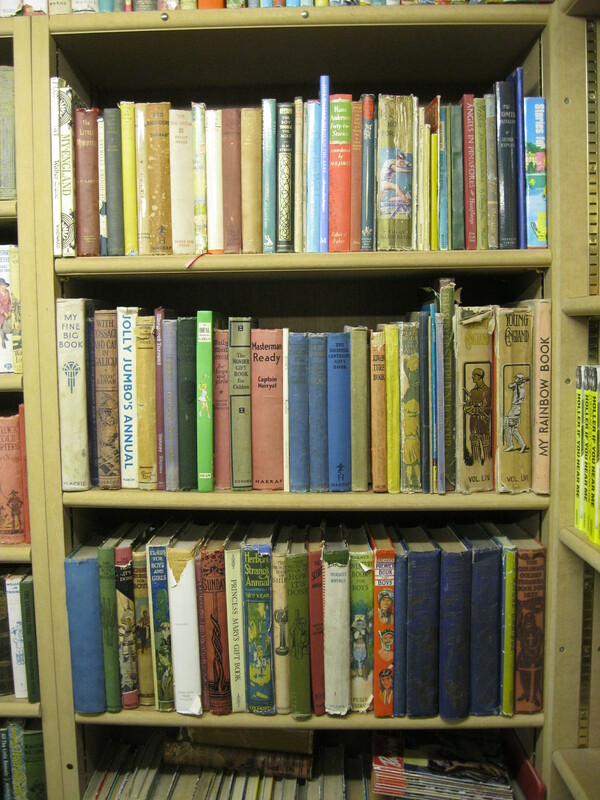 You’ll also see shelf upon shelf of poetry and children’s books, which include obscure, rare and out of print titles that you’ve never heard of as well as the favourites. 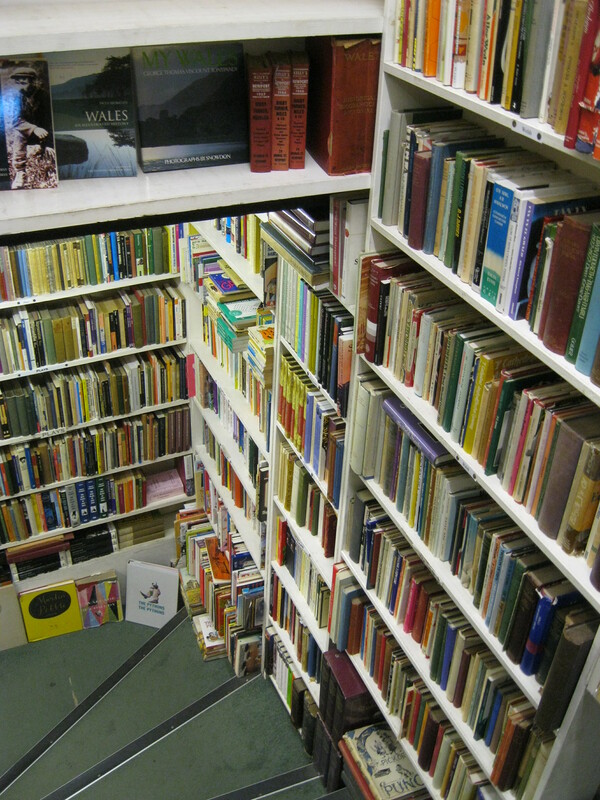 Standing in the centre of the floor is a tower filled of secondhand Penguin paperback editions of classics, which are the staple of any good used bookshop and are usually quite cheap. 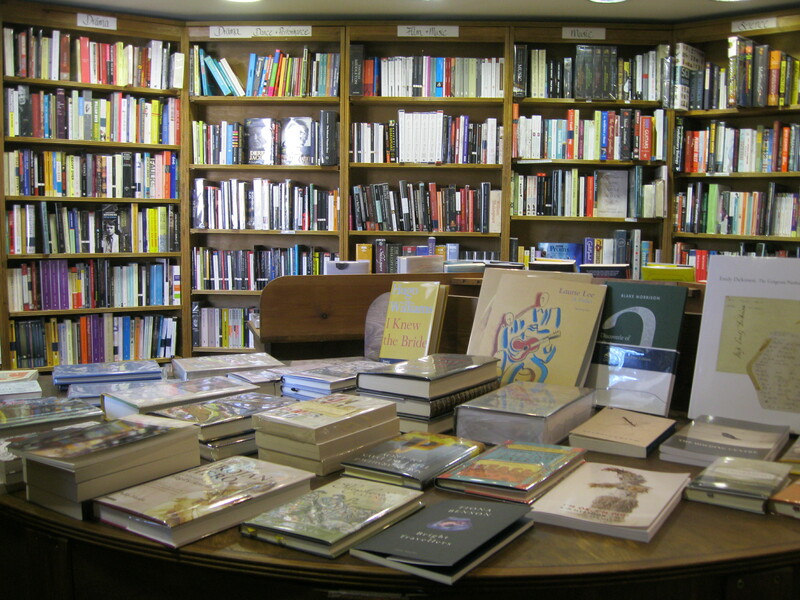 The shelf, a stand-alone cube in the middle of the floor, is a perfect symbol for what it is that I love most about bookshops; as you explore one side of it, you never know what interesting new book or person might be waiting for you on the other side. As you move further back , you find brilliant history and politics selections as well as books about culture, art and music. Although I love every book, based on the sheer virtue of its being a bound collection of white paper with black type, I am biased to novels and poetry, so I sometimes tend to skim over other sections. But the other sections here at Hay-on-Wye Booksellers remind you of how much you might miss by doing that, with selected titles prominently displayed with their covers out, enticing readers with promises of distant times and far-off places, or careful and considered analysis of the not-so-distant. The more I do learn from non-fiction (when I can get my nose out of an escapist novel and pay attention to the real world, that is) the more I’m able to see the bigger pictures behind the well-known little stories that we tell ourselves. Reading the stories of nations and populations as well as of individual lives can explain and illuminate a single event. I have found this particularly when reading Middle Eastern literature in a post-9/11 world. Whether it’s Peter Tomsen’s epic non-fiction work The Wars of Afghanistan or Kamila Shamsie’s novel Burnt Shadows, reading about the world instead of just swallowing media sensationalism gives more depth and breadth to our understanding of the world around us, proving once again, how reading makes us better people. A few weeks ago I saw this in practice. I was watching a stage adaptation of To Kill A Mockingbird at the Regent’s Park Open Air Theatre. As Atticus handed down his now familiar message that ‘you never really know a man until you stand in his shoes and walk around in them’ I wondered how much they had affected my personality since the first time I read the novel at thirteen years old. In the intermission, I was stuck in the queue behind a terrible woman who was growing not just frustrated but downright angry at the understaffed team of young baristas who were taking just a little bit too long to get her her tea. It’s astounding how we can sit and watch a play about the importance of empathising with others and then five minutes later, be completely unable to do so. My point is that books – fiction or non-fiction – can make us better people by asking us to think about things that lie beyond us as individuals. But only if we actually read them with open hearts and minds and let them make those transformations in us. And I’m coming down off my soap-box … now. 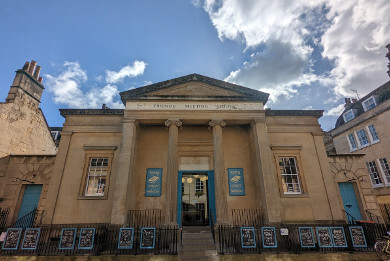 I know that I’ve praised the wide selection of every bookshop in Hay and probably sound like I’m recycling the same clichéd compliments for all of them, but the most astounding thing about this town is its ability to delight and impress you over and over again each time you walk into a new bookshop. 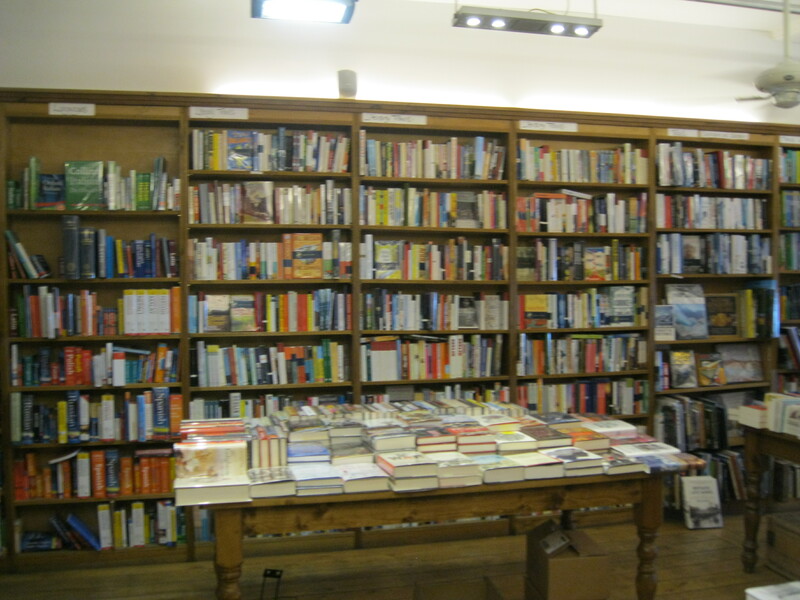 In this shop in particular, though, as books spill off the shelves and collect in puddles on the floor, I was struck by the feeling of possibility that this abundance of bookshops and abundance of books gives to the browser. I could learn anything here, be anyone, go anywhere. It’s the feeling I had going into my grade one classroom for the first time when I was six, or the first time I ever saw Senate House Library in London. It’s a feeling of awe at how much there is to see and do and read and feel and think in the world and how lucky we are to have books to help us access even just the tiniest little sliver of all of it for ourselves. It’s a very, very good feeling. Although this first floor alone might seem overwhelming enough, there’s more . Just like in the Poetry Bookshop, this shop has a wall full of books that leads you up the stairs, albeit slowly, since the books provide a bit of a distraction. As you ascend, you have to try not to block the way too much as you examine the books that lead you from one floor to another. Books are the best guides anyway. Upstairs, when you finally make it, the selection becomes more eclectic. While I may not personally be interested in a book (let alone an entire shelf) on deer management, I am very glad that such a thing exists. Although I must admit that I find some of the more specialised topics quite amusing, in all seriousness, I’m relieved to see them there. I’m reminded once again (as I often am these days) of Murakami’s observation that ‘if you only read what everyone else is reading, you can only think what everyone else is thinking’ which seems to speak to the homogenizing influence of a certain internet giant that tells us what everyone else is buying and suggests that we must therefore buy it too. 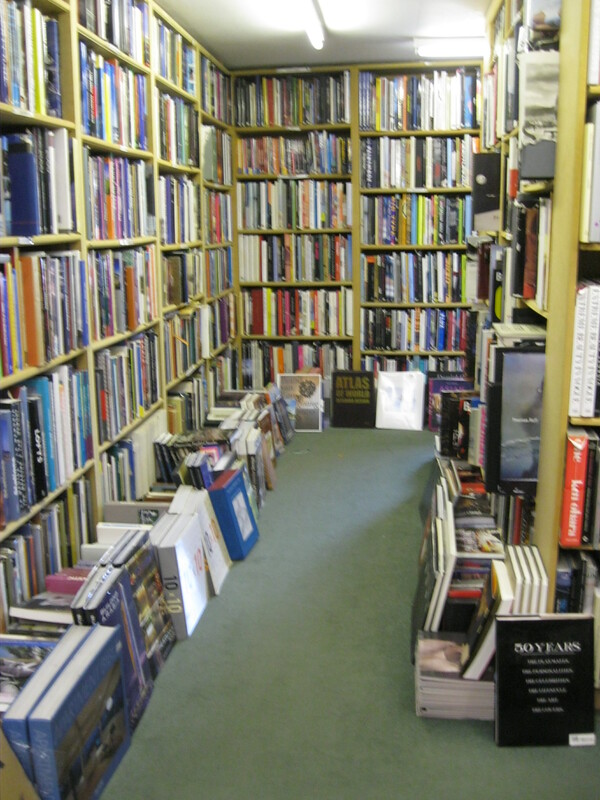 The upper floor of this shop also has an excellent selection of more history and art books, as well as philosophy, psychology and theology books and a selection of comic books and graphic novels. 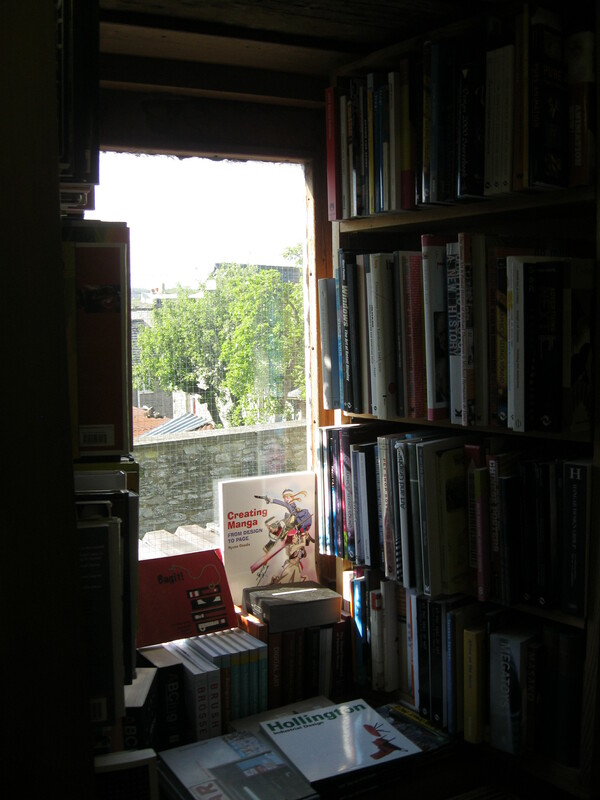 The little windows, somewhat blocked by books, I’ll admit, provide beautiful views of the green and pleasant lands beyond the town, reminding browsers that the outdoors (on sunny days anyway) is a beautiful place to adventure and to read. 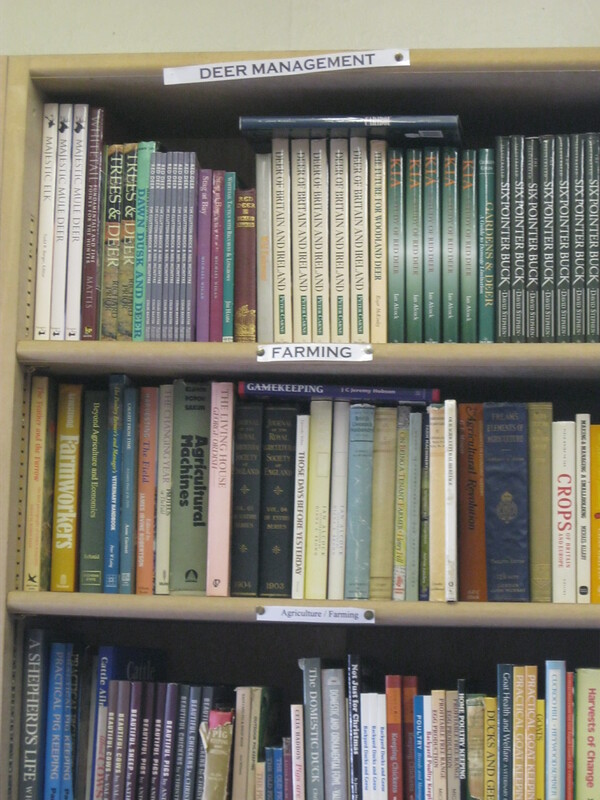 This bookshop, like most of Hay’s, sells mostly secondhand books, with some rare and antiquarian books sprinkled in. The nature of secondhand bookshops is that their price range is often quite large. While a paperback copy of The Great Gatsby printed a few years ago with only a few scuffs might go for as low as 50p, a dog-eared, crumpled first edition with a significant ex-libris would cost thousands. I think there’s something wonderful about that. Although both copies contain the exact same story, the history embodied in one copy makes its value greater. The variety which secondhand bookshops provide offers opportunities for everyone to read whatever they want, regardless of how much money they have to spend, while simultaneously asserting that it’s not the beauty of the thing but the collection of stories it represents which is valuable. Books might be the only commodity in the world that actually become more valuable as they becomes dated, irrelevant, dusty, unattractive and well-used. This was a welcome reminder for me, since sometimes I feel just a little bit bad about how much I enjoy buying books. As much as we like to tell ourselves books are special, they’re still just material objects, aren’t they? They’re things, products, commodities. Sometimes I ask myself, is building a beautiful library of books just a more socially acceptable form of hoarding? Is coveting them, feeling sad when I lose them and not being able to bear to leave them behind nothing more than commodity fetishism? 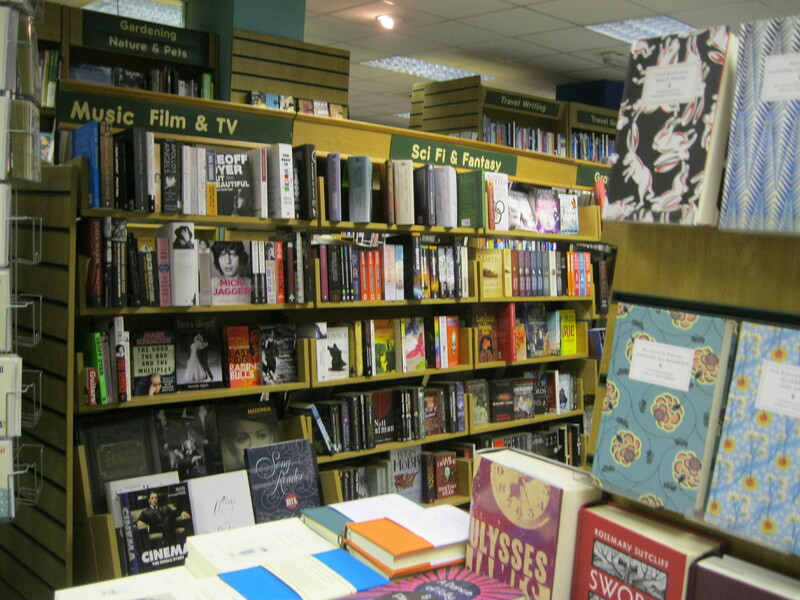 And then I go somewhere like Hay-on-Wye Booksellers and I’m reminded that, although some books are nothing more than products, designed to fill a demand in the market (cough, cough, Twilight-spin-offs), the really good ones are so much more. If I were to buy an iPod and then drop it, crack it, spill on it, scratch it up and let it become five years out of date, no one would want it anymore. But the more we love and use and personalise our books, the more they mean to the people to whom we give, lend and bequeath them. The lovely booksellers (because aren’t all booksellers always lovely) in this large but intimate bookshop reminded me of why it’s okay that we define ourselves by the books we’ve read and why collecting them is somewhat (if only just somewhat) different from any other kind of consumption. As I listened to the women behind the till chat to each other about the books they’re reading and watched them spend ages walking around the bookshop helping customers, I couldn’t help but wonder how much money they make. Booksellers aren’t in it for the money. They’re in it because they love books and they want to share that love, foster it in others and make sure that their favourite stories never stop being told and told and retold and then maybe lost for a while and rediscovered and told once again. They’re in it because they believe, like I do, that reading makes you a better person, if you would only just let it. In a world where few possess the patience for browsing and laziness-enablers are everywhere, I’m worried about a lot of bookshops. 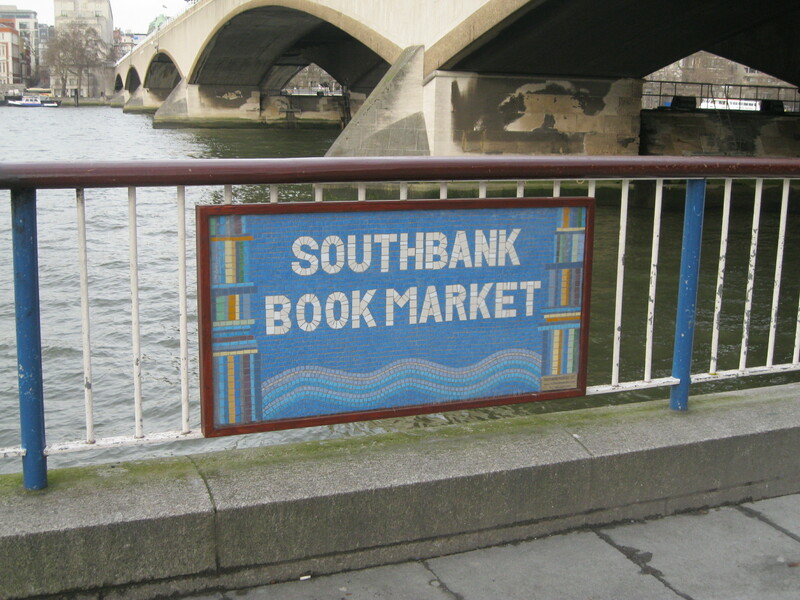 The Southbank Book Market isn’t one of them. 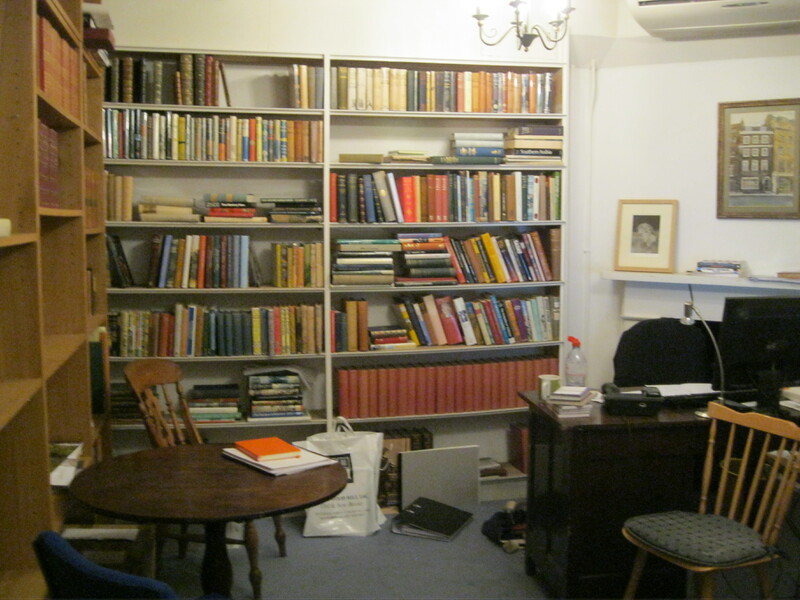 Okay, technically it isn’t so much a bookshop as a bookspace. But you know what, last week I wrote about a boat with books in its belly where cats like to lounge and everyone talks like a pirate, so the rules have apparently been thrown out the window anyway. 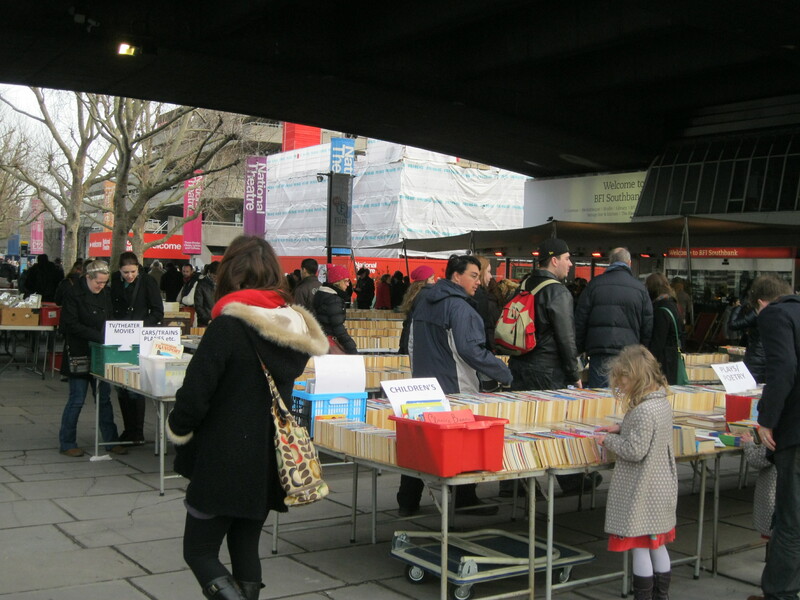 The reason I have no doubts that there is a place in London’s future for the Southbank Book Market is that it is, in every way, so London. One of the city’s best-kept secrets, it is situated on the south bank of the Thames. Vaguely reminiscent of the world-famous book stalls that line the Seine (my second-favourite European river), the market partakes in the quintessential London tradition of amazing things that just kind of pop up out of nowhere while you’re passing through. Of course, it is located in one of the best parts of London to idly pass through, with its famous neighbours like the London Eye to the West, the Oxo Tower to the East, Royal Festival Hall, the Hayward Gallery, the National Theatre and the BFI. In other words, some pretty good company. Walking out from Waterloo station towards the river today, I was approached for directions (twice), saw several street performers, cut through the Food Market which smelled delicious, peeked into the windows at Royal Festival Hall to see if any spontaneous afternoon choral performance was going on (it happens!) and got lost in a crowd of clowns. And I’m not even joking. The place is always buzzing with life and you never know what you’re going to find there. One time, I came across a giant vat of soup that some company or another was giving out for free to everyone passing by and despite but also because of the absolute randomness of that moment, it sticks in my head as the quintessential London moment. Because this city is about the exciting things you don’t go looking for, but which find you anyway. 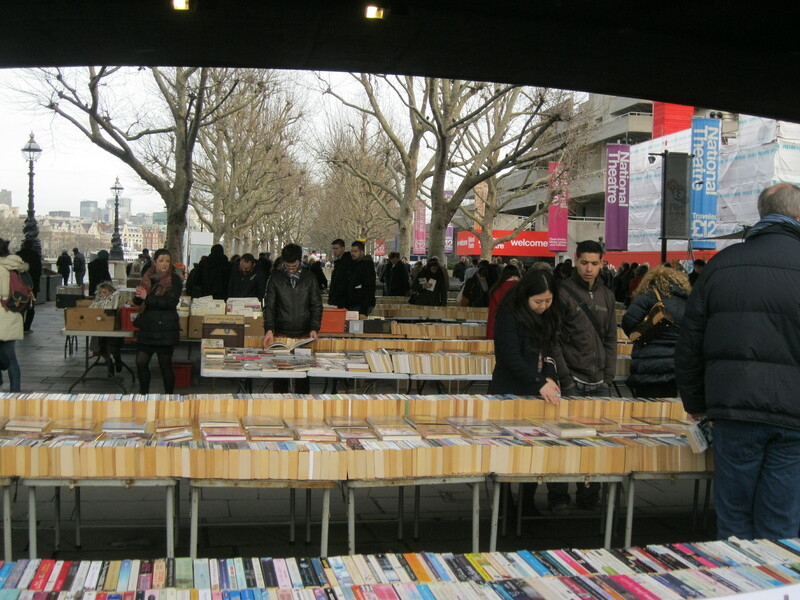 The Book Market is situated in the perfect spot for the serendipitous pass-by and at all times of the day it’s flooded with idle wanderers, readers on their lunch breaks, aspiring photographers, students, tourists and a whole assortment of the other people who wander London’s streets. 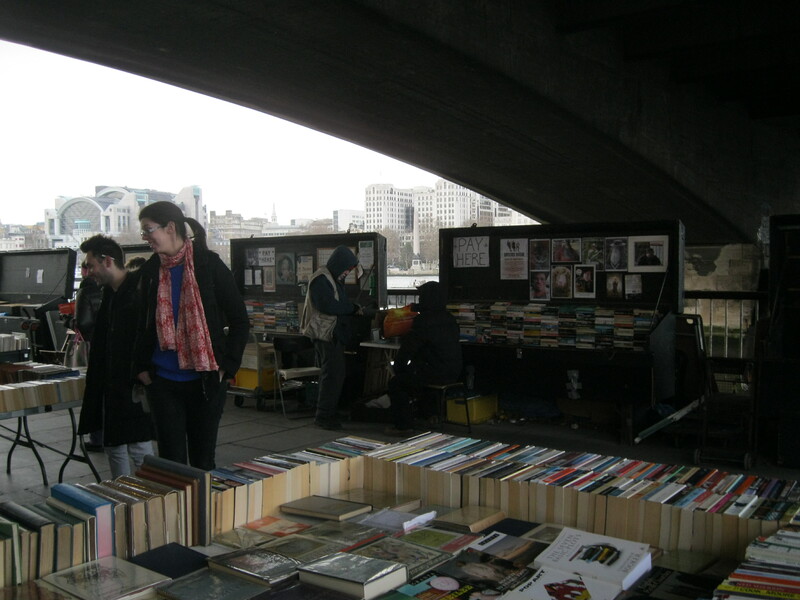 There are probably about ten long tables laid out in a row underneath Waterloo Bridge which comprise the book market. And books cover every inch of all of them. 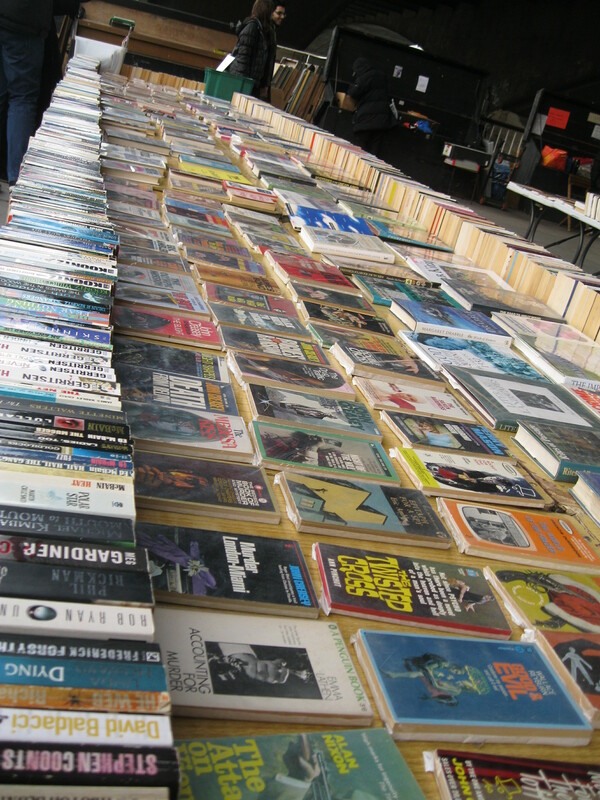 A ring of books standing up on their sides goes around the edges of each table and in the middle, some books are laid flat, given more of a spotlight. I’m not actually sure what the logic is in the choice of books that go in the centre; some are antiques or special editions, some are particularly beautiful or unique books and some are just really odd. 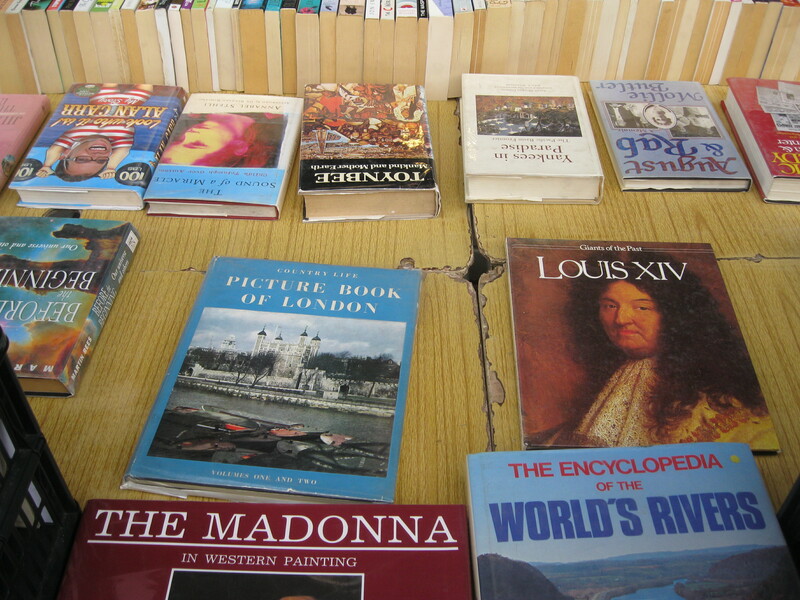 For example, an outdated Encyclopedia of the World’s Rivers; useful, I’m sure, but just a bit random. 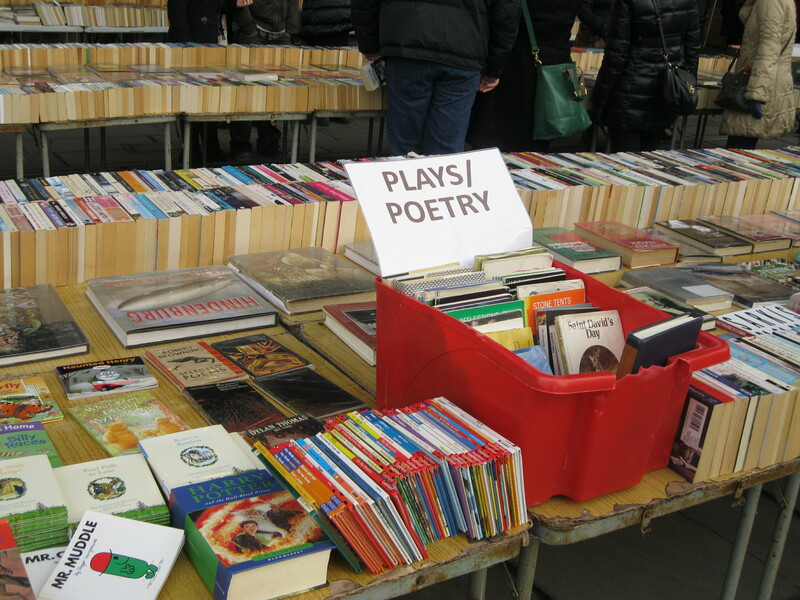 What I love most about the book market is that there are so many different kinds of books. Mass-market paperbacks are all over the place and there’s a huge (if eclectic) selection of science fiction, fantasy and crime paperbacks. 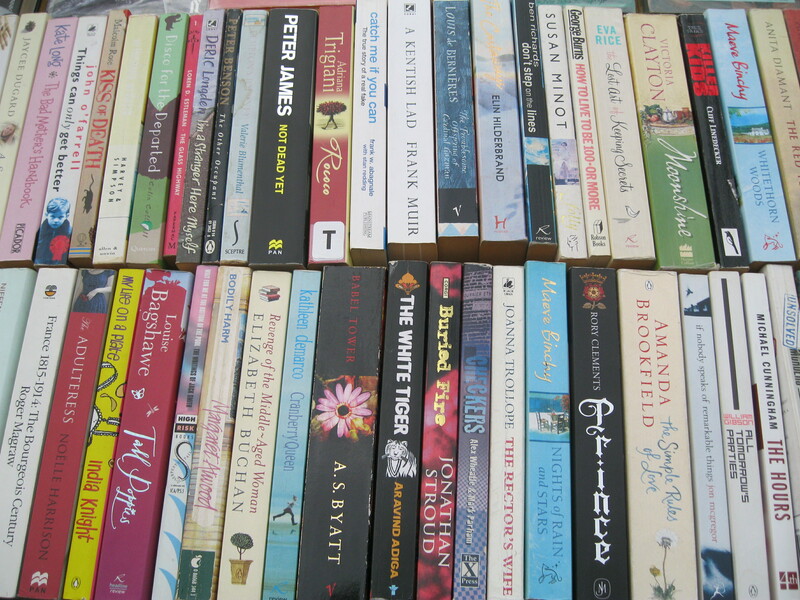 There are also the classics in many different forms, ranging from Wordsworth Classics (code among English students for ‘the cheap edition’) to first editions thrown in there somewhere if you’re lucky enough to spot them. There doesn’t seem to be any particular organisation system either, but trying to figure one out can actually be a lot of (very geeky) fun. As you make your way around the stalls, craning your neck to read the sideways titles, patterns appear to form. It will seem, briefly, that maybe all the Penguin classics are in a line here and all the Pelican classics are beside them, sometimes they might even be vaguely in alphabetical order until you find a sequence of books that goes something like “Atwood, Byron, Conrad, Dickens, The Unauthorised Guide to Twilight, Eliot…” and you realise organisation was a foolish dream. To be honest, it’s a bit disconcerting to see A Portrait of the Artist as a Young Man slotted in next to something called From Notting Hill With Love…Actually. I honestly saw this title and thought it was a parody. Then I hoped desperately that it was a parody and when I realised it wasn’t I fell to the ground and wept. Anyway, back to the books. Some particularly exciting finds today were a 1968 copy of The Adventures of Pip by Enid Blyton going for £6 as well as a couple of other old copies of children’s books, including Blyton’s The Adventures of Binkle and Flip (what a title! ), a 1954 novel Jack of the Circus by Frank Richards and another called Tom Merry’s Triumph, also by Richards. They were old books with beautiful covers and illustrations and all so cheap! I walked away very excited about the two books I bought. The first was The Heat of the Day by Elizabeth Bowen and it was a lovely old hardcover edition from 1950. When I saw that I got really excited because I thought it might be a first edition (I knew it was published shortly after the end of the war), but the first edition was in 1949. Curses! But still, a very exciting purchase and for only £3. I was going to resist, but the deciding factor for me was that when I held it up to my nose and sniffed it smelled absolutely delicious and I think once you’ve done something that intimate with a book you can’t really leave it behind. The other book I bought was Our Mutual Friend by Charles Dickens, another old hardcover from 1956. It was actually part of a set of the complete works of Dickens and they were all only £2.50 each, reduced because there was an ex libris in each one and a bit of scribbling in the corners. Personally, I’d be willing to pay a bit extra for marginalia, but if they want to charge me less, I won’t argue. As much as it pained me to separate this beautiful book with gorgeous illustrations from the rest of its family, I convinced myself it would be okay. With the cold weather in London lately I’ve been feeling the need to read either Dickens or something Russian. I’m about halfway through Nights at the Circus by Angela Carter at the moment and fabulous as it is, it’s just not fulfilling my snowed-in-feeling quota the way Dickens always does. So I spent £5.50 on books. Oops. But I feel okay about it because my purchases are such precious books that I would gladly have paid a bit more for them. After paying, I started to wander around a bit more, just to make sure there wasn’t anything I’d missed. 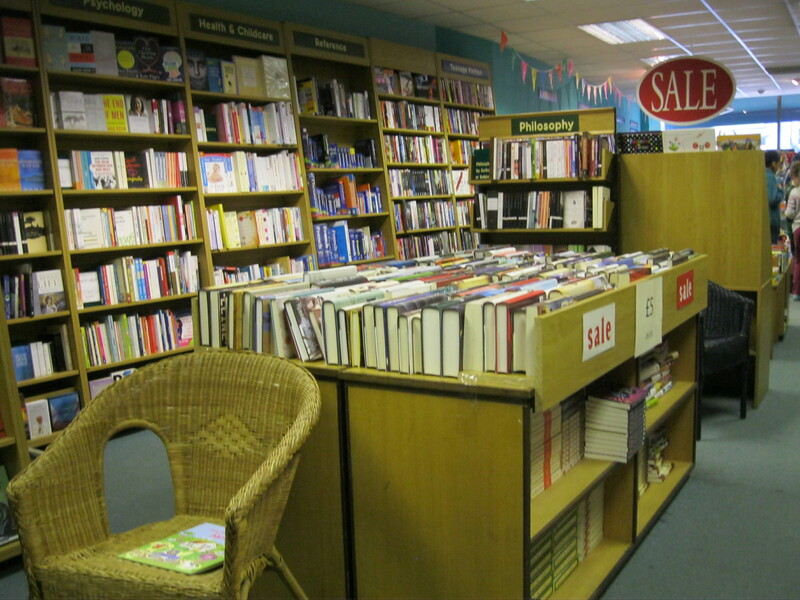 After about two minutes of this I realised I was going to have to call it a day and drag myself out of there, because I kept seeing books I wanted to buy and knowing that they were all cheap enough that I could justify it! It’s a dangerous game, buying books at the Southbank Book Market and, feeling that I hadn’t the required strength of will, I had to reluctantly withdraw. I’ve always had a bit of a hard time with the expression “don’t judge a book by its cover”. Of course, I know that it’s talking about people, not books, but I still think books are an odd place to look to for this kind of sentiment. 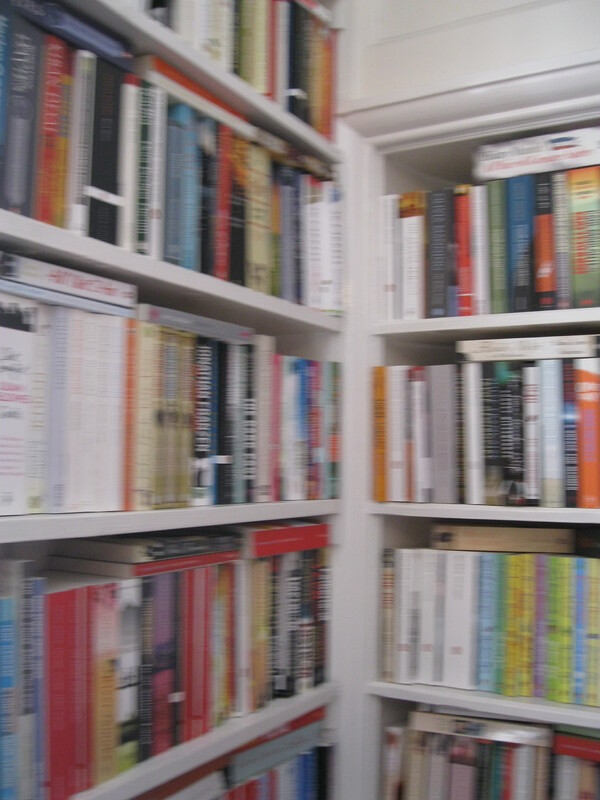 Surely, as readers, we do judge books by their covers, because if the individuality of each edition and each individual book and the degree of love and wear it’s had didn’t make any impression on us, we’d all be reading off our Kindles, where every copy of every book looks exactly the same. Thankfully, we’re not. However I’ll admit that Pages of Hackney is a perfect example of the spirit of this phrase. It doesn’t really look like much from the outside. 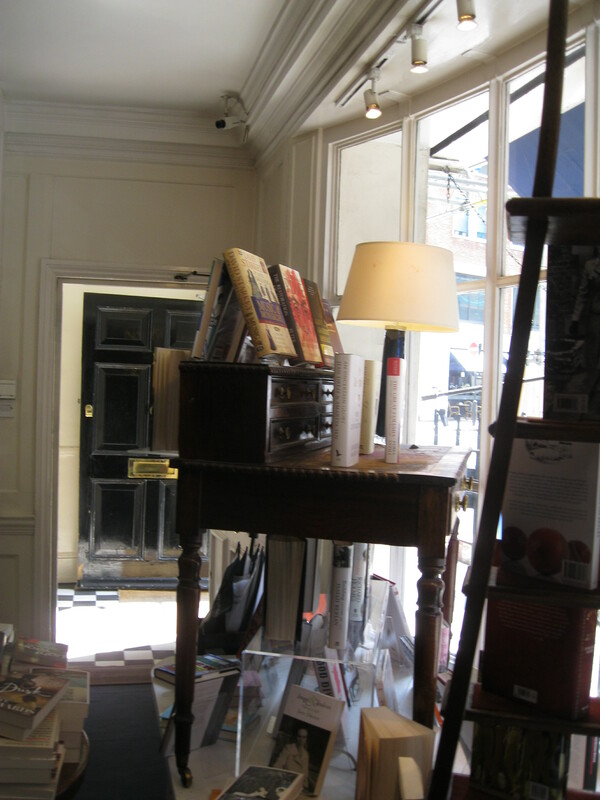 The shop is small, it’s not immediately evident that it’s a bookshop and, in a sympathetic way, it looks a little bit tired. But on the inside, you see that it has a bit more energy than you thought. 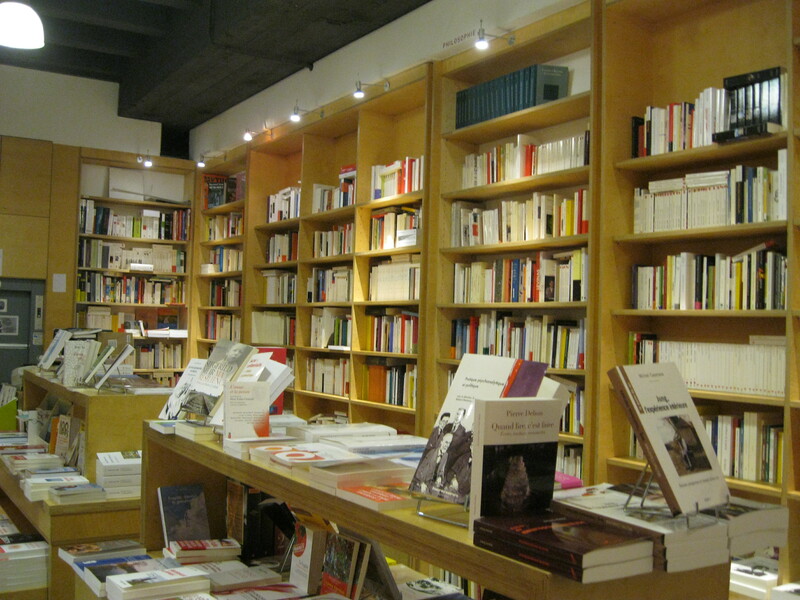 The shop hosts book talks, readings, debates, film screenings and the occasional photography exhibit. Who knew? 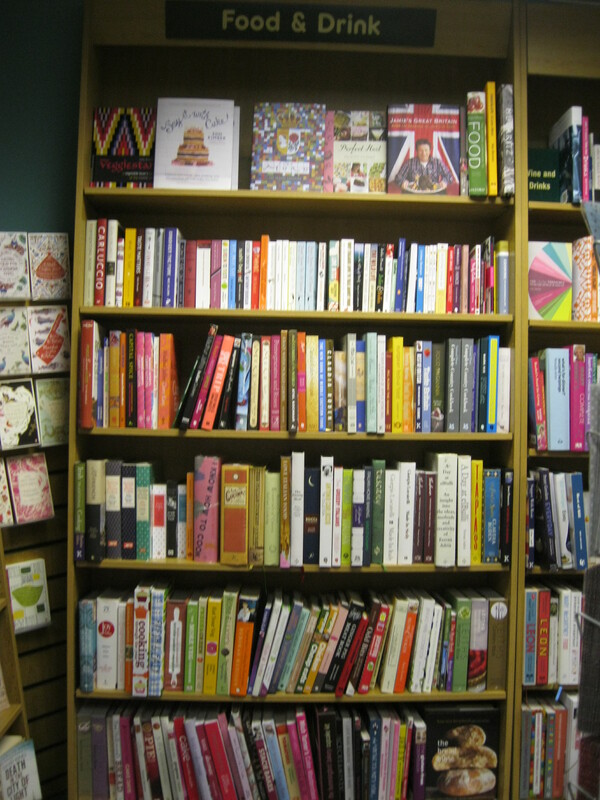 Despite its small size, the shop manages to cram in an amazing selection of books. 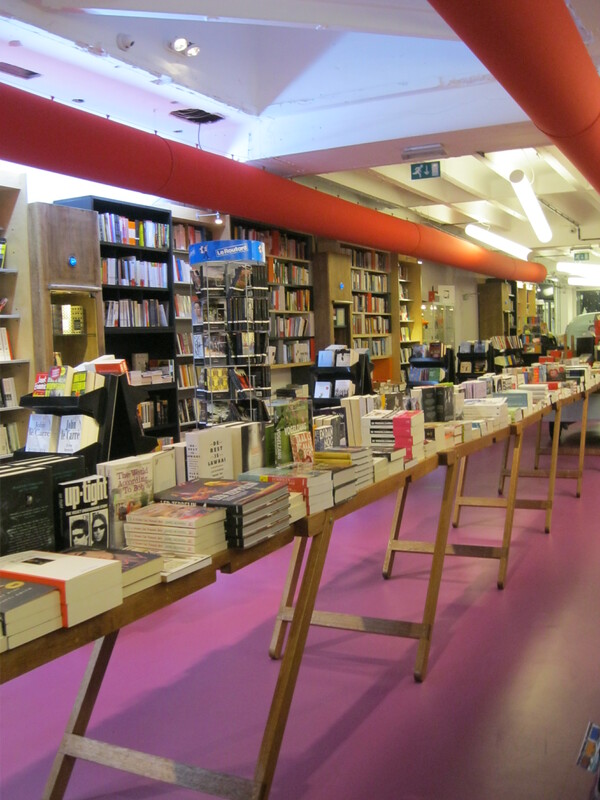 On the ground floor are the new books. 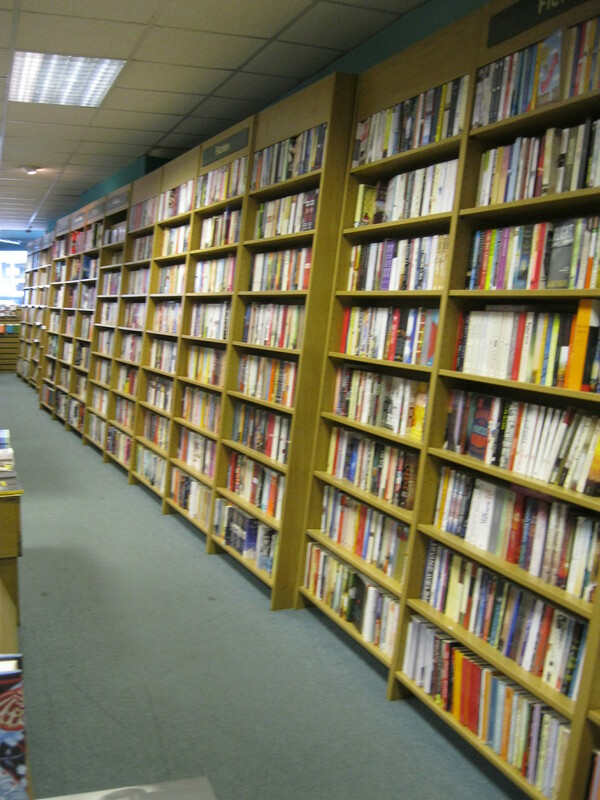 There are many contemporary and classic fiction books, which are all in very good order, although it seems like many have been taken out, admired and put back in odd places, but I think it’s nice that the staff aren’t obsessively trying to straighten up the shelves. I like a little mess sometimes. My favourite thing about these shelves though is that in addition to the usual announcement that we are in the “Fiction” section, the chalk writing on the tops of the black bookshelves sometimes labels them “tall tales” and “yarns”. I wish I knew more about the people who work here because they seem to really enjoy playing with fun and bookish ideas. There are poetry, travel and culture sections, as you’d expect, and a relatively small but very good selection of children’s books. I truly believe that children’s books are just as important as adult ones and possibly more so, since they shape not only the kind of adult books we’ll read, but the kind of adults we’ll be. So, I’m always glad to see a bookshop that replaces the litany of silly, money-grabbing children’s books like “Candy: The Magical Make-up Fairy” (don’t worry, I made that up to prove my point) with books like Inkheart and The Chronicles of Narnia. After a nice long look through the novels (and an envious flip through the hardcover edition of Philip Pullman’s new Grimms’ Fairytales which is so beautiful but so expensive!) I migrated down to the basement and its incredible collection of second hand books. Walking down into the basement, my first thought was “Well, this is a bit odd.” The centre of the room is mostly empty but the walls are absolutely crammed with books. When you move further down into the basement, there’s a couch and an armchair, as well as a tiny child-sized piano (the keys don’t work, I tried), which makes you feel a bit like you’ve accidentally wandered into Alice Liddell’s living room. 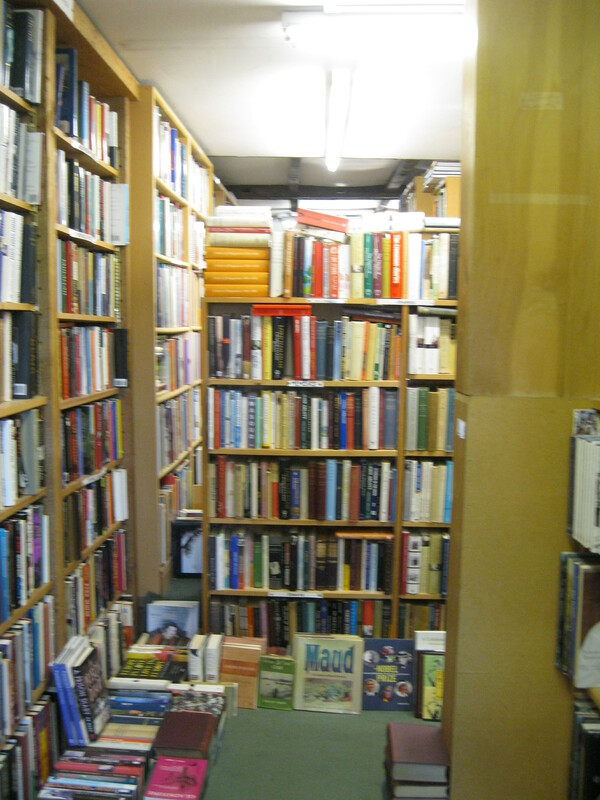 Once I got over the strangeness and started to peruse the shelves, I realised that there was something magical about this poky little basement. There are just so many books! Just when you think you’ve come to the end of them, you notice there’s a table in the corner covered with them and under it another box-full and behind it yet another. But it’s not just the number of books that’s amazing. The books on offer are beautiful and interesting. I found a Chinese novel (I hate that I can’t remember the name!) written in English for the Peking Foreign Language Press. Inside it was tucked a little brochure with a family tree of the main characters and a beautiful Ex Libris label on the front leaf with a hand-written name. It came in its own case and cost only £3. I wanted it so much, but had a hard time justifying the purchase, so I had to leave it. There was also a lovely old edition of Middlemarch with beautiful illustrations and the smallest print you could imagine and loads and loads of vintage children’s books. 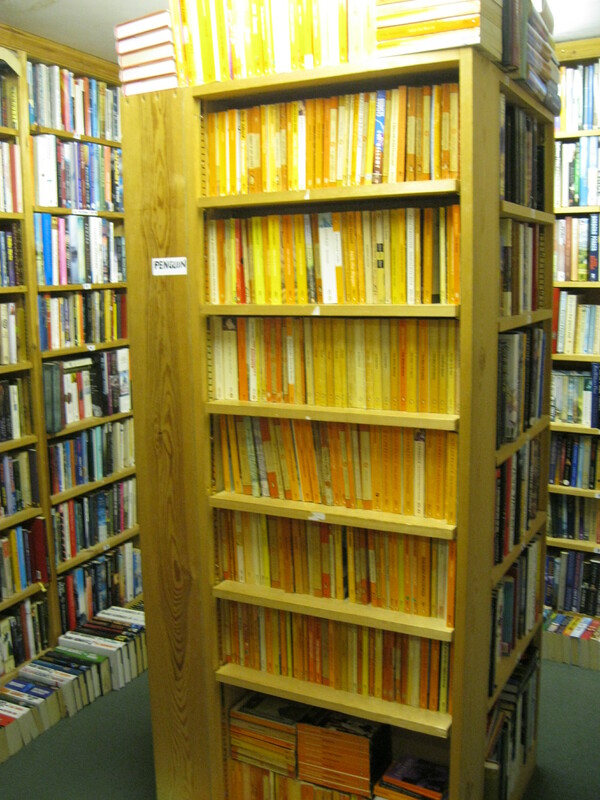 One of the walls was entirely covered by Penguin and Puffin Classics paperbacks. A huge variety of titles were represented. 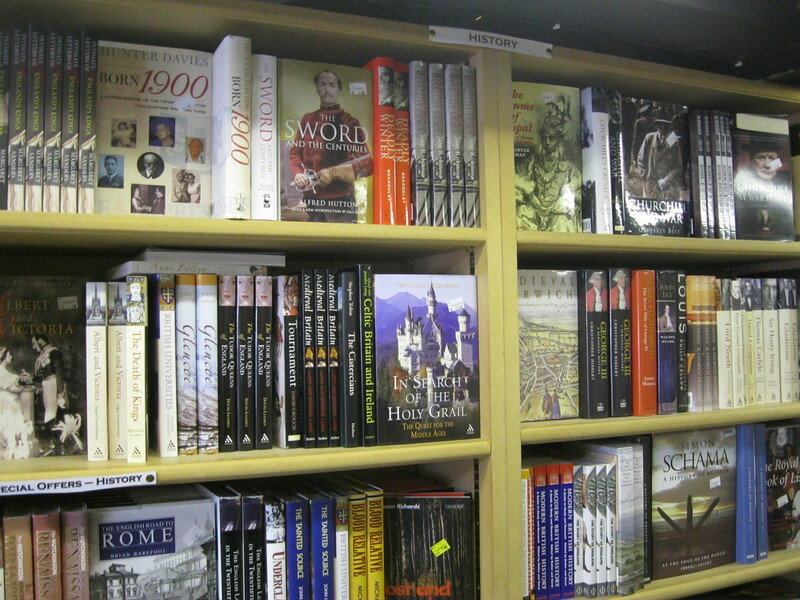 In this section there was, by coincidence or design I don’t know, a huge number of D.H. Lawrence novels. I bought The Rainbow, one of Lawrence’s earlier novels, for £4. I haven’t read it before and I seem to vaguely remember it having some kind of connection to Women in Love. I’ll read it and let you know. I also dragged my boyfriend along with me today (not that it was that hard) and he bought a £3 collection of essays by Jon Stewart. Brilliant. 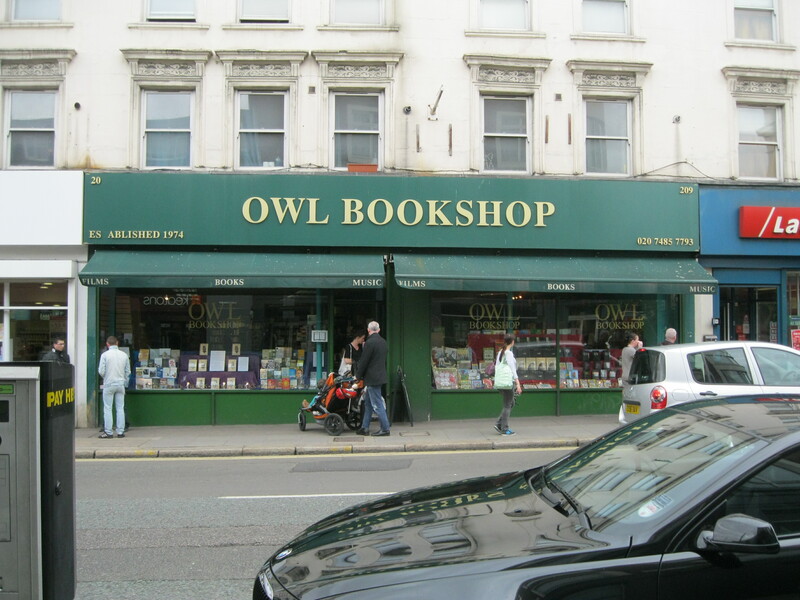 Anyway, what amazed me most about this bookshop was just how inexpensive all the second hand books were; some were so beautiful that paying a measly £3 or 4 felt like stealing. I think Pages has struck a perfect balance between the modern publishing industry upstairs and the joy of used books in the basement. In addition to The Rainbow, I also picked up something very exciting; a map of London’s independent bookshops! Some I’ve already written about , others I’ve been to and want to write about, but there were many I had never heard of, which means that now I have even more ammunition to throw into my anti-Amazon revolution! And boy do we need a revolution. In the bookshop today, there was a little girl, probably four years old. She had picked up one of the second hand children’s books and was holding it softly, like the treasure it was. She asked her parents if she could buy it and I think her heart and mine broke when they said no. It reminded me of a time when I was working in a bookshop and a little girl dropped her fuzzy pink purse on the ground because she was walking around with her face buried in her book. Her mother scolded her for not taking better care of the purse and said “It’s like all you care about is that book.” I couldn’t believe it; that kind of behaviour from little children – especially little girls – should be praised and encouraged, not criticised! I know that sometimes books can be expensive. But isn’t that all the more reason that we have to make sure that we protect not only bookshops like this, but also our public libraries? I’ve been told that digital readers are a good thing because ebooks are cheaper and thus, by some kind of logic, an equalising force. I can’t believe someone is trying to defend ebooks by this kind of weak moral argument. The truth is, in this day and age, it’s not difficult for children to get their hands on books. I don’t know about you, but it seems to me like teachers and librarians and parents and siblings and every adult in their lives wants children to read more. The issue is inspiring the children, and from personal experience, being the keeper of a book is the best way to learn to love them. Being given the responsibility to care for a beautiful book, whether borrowed or bought, teaches a little girl that books are important, sacred, but most importantly hers. It shows that she has the ability and the right to access this magical world of knowledge and imagination and creativity. I truly don’t believe that there’s any greater educator than that.